Renal carcinoma is among the 10 most common cancers, representing 3.7% of all new cancer cases. The incidence has been kept rising worldwide and the prognosis remains poor. Clear cell renal cell carcinoma (CCRCC), a renal cortical tumor characterized by malignant epithelial cells, is the most common type of renal carcinomas, constituting 80% of all cases. Over 30% of patients present with metastasis at the time of diagnosis [1–3]. Cancer stem cell (CSC) is a critical factor during CCRCC development because it promotes metastatic spread . CCRCC stem cells (CCRCC-CSCs) express marker gene CD105 and stem cell markers Nestin, Nanog, and Oct-3/4. Despite successful isolation of CSCs in 2008, insufficient progress has been made towards decoding the roles of CSCs governing CCRCC development in the past decade . It is of paramount importance to understand the molecular mechanisms by which CSCs mediate and accelerate CCRCC metastasis to develop efficient strategies for suppressing metastasis. The study reported by Grange et al. 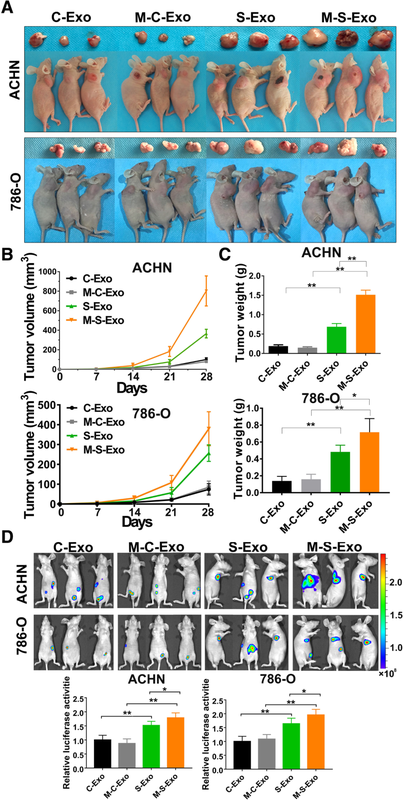 demonstrated that exosomes from CCRCC-CSCs accelerate the metastasis of cancer cells in tumor xenografts mice . 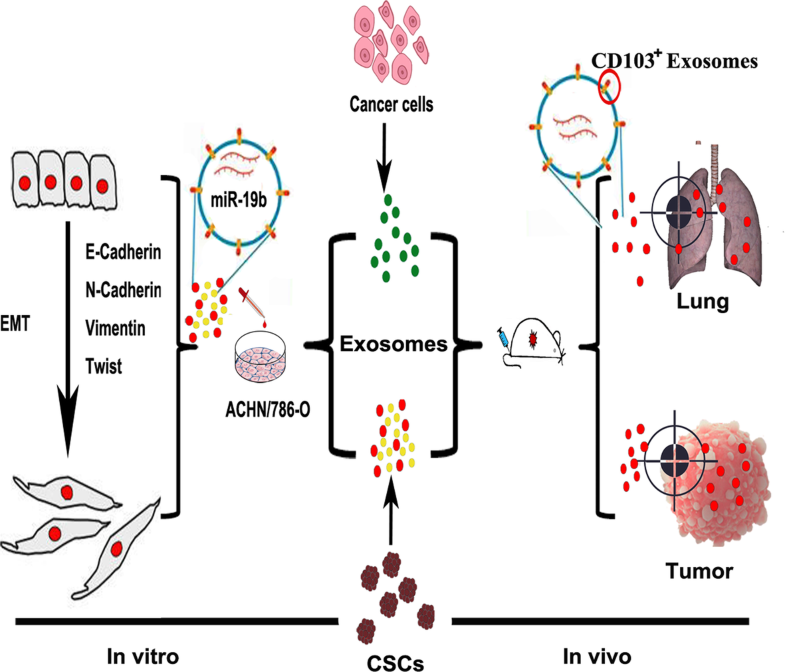 If CSCs derived exosomes is an indispensable approach for distant metastases in CCRCC. 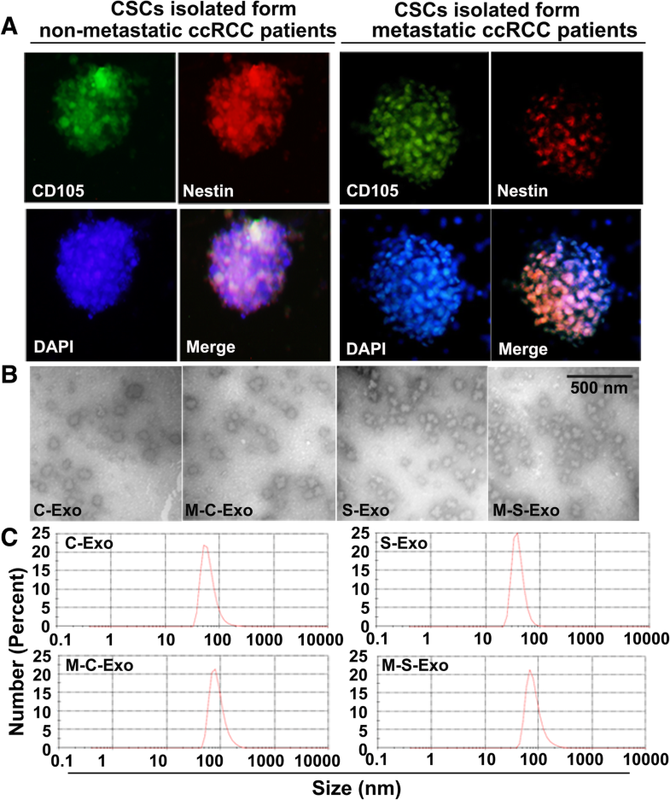 Exosomes (30–150 nm in diameter) can be secreted from multiple types of cells and they participate in intercellular communications by transmitting intracellular cargoes (such as proteins and nucleic acids) into sensitive target cells [7, 8]. Exosomes have gained considerable attention in patients with urogenital cancers, both as mediators of intercellular signaling and as potential sources for the discovery of novel cancer biomarkers . Exosomes released into tumor microenvironment and bloodstream known as ubiquitous messengers, have a strong impact to distant tissues . Exosomes help cancer cells take root in other organs far from primary tumor site, or metastasize, the process that ultimately leads to the overwhelming majority of cancer-associated deaths (about 90%) [11, 12]. Exosomes derived from gastric cancer  and breast cancer  can initiate the pre-metastatic niche in the liver, lung and brain. Specially, stem cell-exosomes in premetastatic niche formation and biological characteristics of the cancerous stromal elements may offer novel targeting opportunities and have prognostic and predictive values . 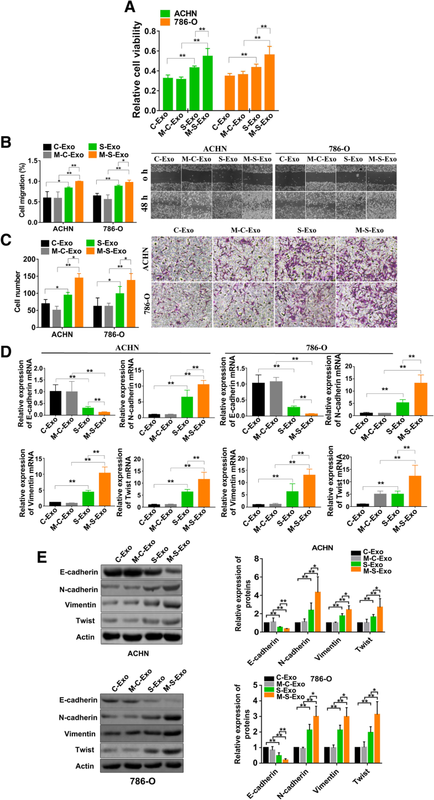 Epithelial-mesenchymal transition (EMT) and mesenchymal-epithelial transition (MET) trigger the dissociation of carcinoma cells from primary carcinomas, which subsequently migrate and disseminate to distant sites. As Nicholas Syn and David Lyden introduced EMT/MET is an essential progress of exosome-mediated metastasis [16–18]. 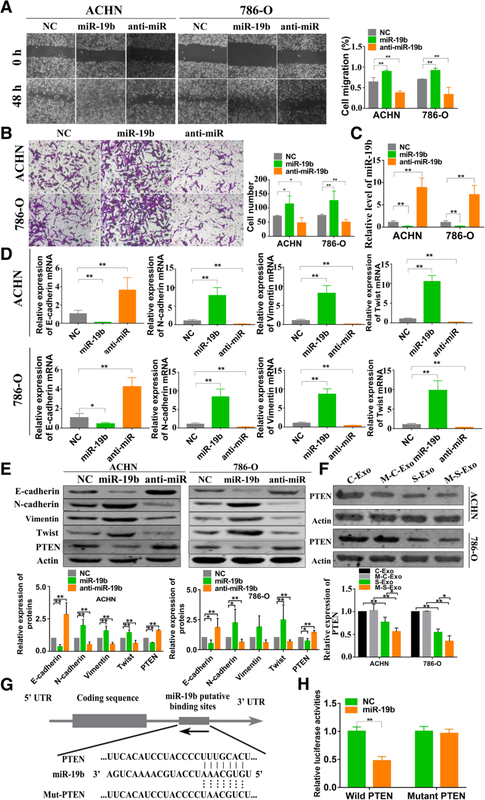 Owning to the important contribution of EMT to specific stages during metastatic progression , the regulatory effects of exosomes on metastasis may actually be mediated by their regulation on EMT. It was reported up to 30% of all renal cell carcinomas have distant metastases at the time of diagnosis. Lung metastases in renal cell carcinoma is the most common among various sites, accounting for 52% of the total [1–3]. More frustratingly, CCRCC patients with metastasis are facing with rather limited therapeutic approaches in the clinic at present. Therefore, it is necessary to uncover the intertwined mechanisms behind of metastatic initiation and occurrence of CCRCC and identify efficient therapeutic targets for metastatic CCRCC. In this study, we collected the CSC and cancer exosomes respectively derived from metastatic and non-metastatic CCRCC patients and investigated their relative strengths in conferring the malignancy to tumors. The main findings of the present study can be summarized as following. (1) CSC exosomes were significantly more malignant than cancer exosomes. 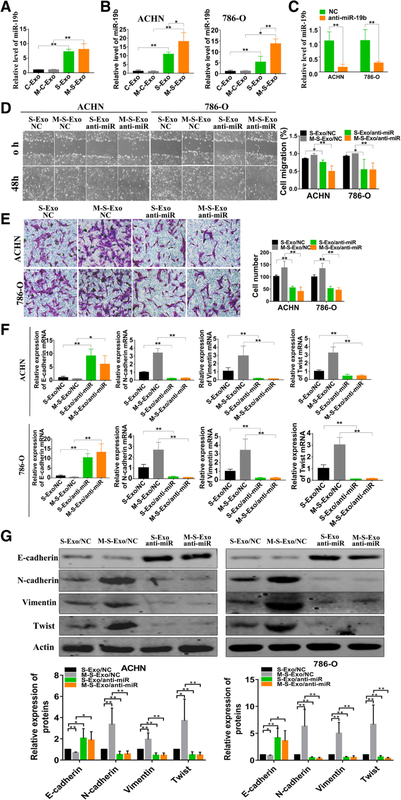 (2) CSC exosomes strongly promoted EMT thereby the migration and invasion capacities. (3) MiR-19b-3p incorporated into CSC exosomes and transferred by CSC exosomes to cancer cells played the key role in EMT via targeting PTEN. (4) An integrin CD103 enriched in CSC exosomes was a critical determinant of organotropic metastasis of CSC exosomes thereby miR-9b-3p. The larger proportion of CD103+ exosomes over total exosomes in CSCs of metastatic patients seemed to be a crucial factor in directing metastatic sites of exosomes (Additional file 2: Figure S1). 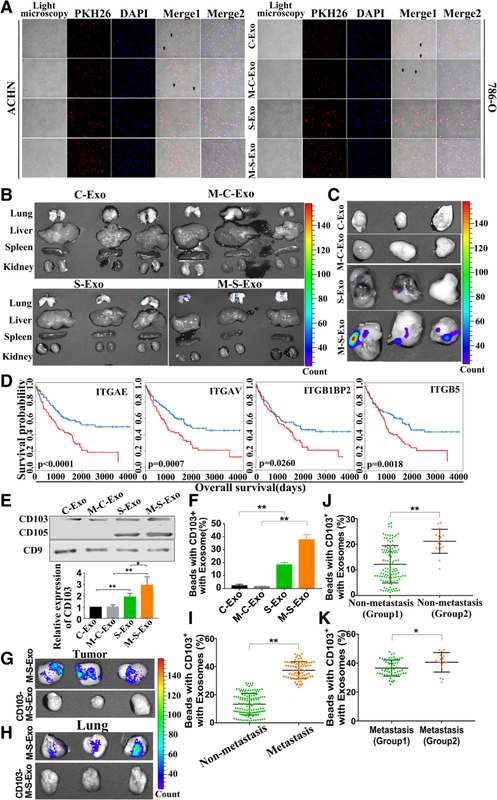 Present reports proved that cancer cell population can obtain some properties of CSCs during the EMT process [30, 31]. In our study, CCRCC cells obtained high ability of metastasis via EMT promotion induced by CSCs-derived exosomes, which similarly act as CSCs.